The new XQ1 is clearly designed to take on the all-conquering Sony Cyber-shot DSC-RX100 (our Compact Camera of the Year in 2012) and the popular Canon PowerShot S-series. It essentially offers image quality somewhere between the two at a very attractive price that is lower than both, whilst offering the same appealing retro design and great build quality that epitomises the X-series camera range. Built-in wi-fi connectivity, intuitive handling and speedy performance form the icing on what is already a very rich cake. The image quality from the large 2/3-inch CMOS sensor with no low-pass filter is markedly better than virtually all other compacts, with the exception of the RX100 / RX100 Mk II. Noise is noticeable only by its almost complete absence from ISO 100-800, with the faster full-resolution settings of 1600 and 3200 also being very usable. The 4x lens is commendably sharp and distortion free at both ends of its focal range, while the f/1.8 maximum aperture at 25mm makes it easier than most compacts to creatively throw the background out of focus (although it does quickly slow to f/4.9 at full telephoto). We love the innovative E-Fn menu system, which effectively makes up for the XF1's reduced number of external controls, while the control ring that surrounds the lens, whilst not so original, also plays a big part in making the XQ1 very easy to use. Even better are the XQ1's lightning-quick reflexes, with incredibly quick auto-focusing and operational speed, enhanced manual focusing that you'll actually want to use, and all-round level of responsiveness that will rarely leave you waiting. 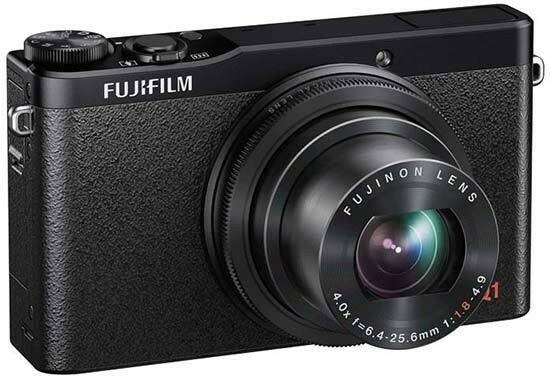 If Fujifilm had released the XQ1 in 2012, instead of the flawed XF1, they would definitely have had a big hit on their hands. As it stands at the end of 2013, though, the incredibly popular Sony Cyber-shot DSC-RX100, with its bigger sensor, pretty much has things sewn up, especially considering that it now only costs a little more than the XQ1's launch price. So while the new Fujifilm XQ1 is an excellent premium compact in its own right, you should definitely compare the two side-by-side to determine which best suits you (and look carefully at our sample images for both models).